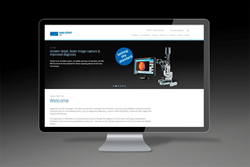 Haag-Streit UK, the leading manufacturer and distributor of gold-standard optometry and ophthalmic equipment, is pleased to announce the launch of a brand new website at http://www.haagstreituk.com. We’re excited to launch a new website and e-shop. Both were developed based on valuable customer feedback, using the latest online technology. We are confident that both sites will provide a dynamic, positive visitor experience. Optimised for mobile devices, such as tablets and smartphones, this new website hosts a wealth of information on HS-UK’s portfolio and services. Visitors can access product information, brochures, clinical studies, white papers and view video content 24-7. The website’s navigation offers a vastly improved user experience. Visitors can simply select the top navigation link and HS-UK’s full product range appears in an easy-to-read display. Product information is now displayed using a simple overview. If customers wish to view more in-depth information, they can do this immediately using the ‘read more’ options. In addition, a new HS-UK e-shop has been launched at http://www.haagstreituk.com/eshop, where customers can purchase HS-UK’s top-selling brands quickly and efficiently. Visitors are encouraged to view the e-shop regularly to take advantage of exclusive online offers. The e-shop has integrated powerful shopping cart technology that allows customers to order seamlessly online. Customers can pay through PayPal, either by using their existing PayPal account or by debit and credit card.